Chips Ahoy! 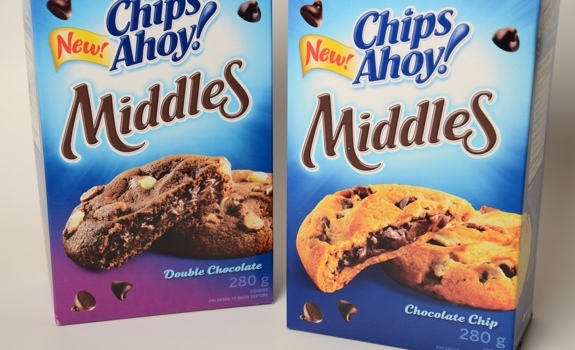 Middles, in their very Chips-Ahoy!-ish boxes. Chips Ahoy! 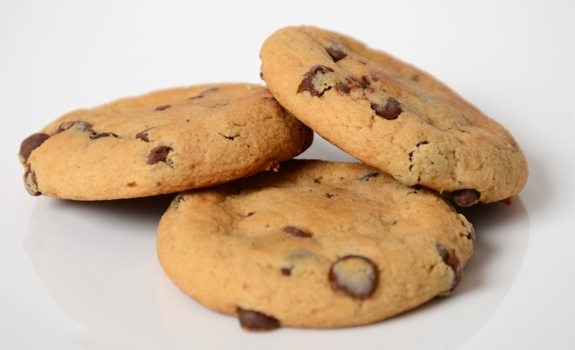 cookies are not part of my current everyday life, but they were when I was a kid. Every day, I’d get at least a couple of them tucked into a baggie in my lunch bag as dessert. (Only to be eaten after finishing my mustard, carrot and lettuce sandwich. Yes, that was my choice of sandwich, and yes, I was a strange kid.) They were dry, they were filled with chocolate chips, and if you sucked on them long enough, they’d turn into mush. Awesome. And yet, after years without a Chips Ahoy! cookie, an ad on T.V. for these curious new cookies brought back pangs of nostalgia. A Chips Ahoy! with a filled centre? Yes, please. Note the filled middles in Chips Ahoy! Middles. I sampled two varieties: chocolate chip and double chocolate. The Pitch: The name says it all. They’re Chewy Chips Ahoy! with a chocolate-filled middle. Hence, Chips Ahoy! Middles. The Look: On the outside, like regular cookies. It’s what’s inside that counts. The Taste (Double Chocolate): Meh. Sweet and doughy. Yes, there’s lots of chocolate, but it’s not very good chocolate. Tastes half-baked and chemical-ish. Not a very nice aftertaste. 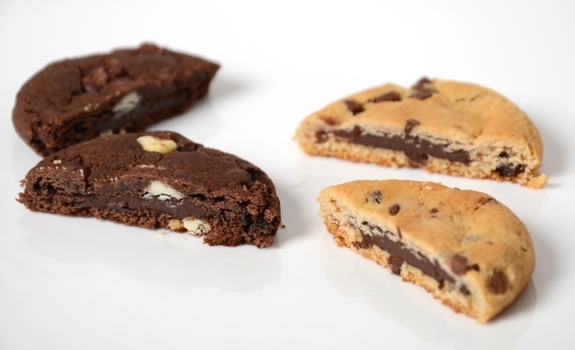 The Taste (Chocolate Chip): A noticeably mushy, melty chocolate inside. Not as cloying as the double-chocolate, but still not great. They’re bland, they’re got a soulless taste, and they don’t stack up well against the cookies baked fresh in a grocery store, even though those cookies also likely came from a tub filled with industrial dough. They're kind of pretty for a mediocre mass-produced cookie, no? Cost: $4.12 for a 280 gram box at Safeway. Value for cash money: Decent, unless you consider the taste. Nutrition? 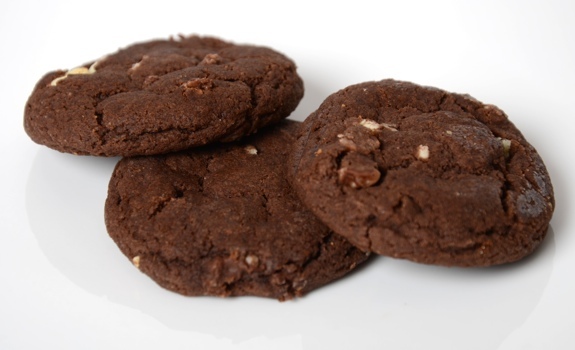 : Per 2 cookies (31 grams): 150 calories, 7 grams of fat, 110 mg of sodium, 0 grams of fibre, 1 gram of protein. The verdict: Meh. Even though it’s been ages since my last Chips Ahoy! cookie, I apparently haven’t missed very much. They taste like cookies that were baked a long time ago in a factory far, far away. Double-chocolate. They look more delicious than they actually are. I just took it for granted(at least subconsciously)when I saw the ad that the filling/middle wasn’t likely to be Valrhona chocolate*snicker snicker*. Getting cynical in my old age I guess. I mean we’re talking Chips Ahoy here…but I admit I’ve also eaten more than a few over the years. The Chewy version as recently as late 2009…or was it ’10? I have so many happy memories of scarfing down Chips Ahoy! cookies as a kid, I felt compelled to try another CA! product as an adult. While I haven’t had a standard CA! cookie in some time, they must be better than this. There’s clearly some kind of flavour/texture trade-off required to fill these and make them soft. Very disappointing.. I bought this product with the hopes of biting into a slightly crunchy cookie, just OOZING with a rich, creamy chocolate center that closely resembles a snack cake… how wrong I was. It’s like a very thin slab of dry paste – that makes NO impression at all – balled inside a sad excuse for a chocolate chip cookie (even for Chips Ahoy! standards), but in the same breath I’d go out and buy a couple more. I find that the Double Chocolate version of this cookie is at least salvageable in the taste department. Yes! Paste is exactly the word. And you’re right about the cookie itself, too. If it was crunchier on the outside, at least the contrast of textures would have been more interesting. Instead, stale mush filled with paste. Ugh. I never thought id say this, but Mr Chritie really dissapointed me. After so many years of not having those scrumptious CA! Cookies, the CA! Middles were very bland and tasteless. Dry, stale mush filled up with dry paste, not oozing chocolate fudge. Mmmmm…. but no, just stale mush and dry paste. Ugggghhhhh……. I thought these cookies actually tasted pretty good. I liked the soft, mushy texture. I am no cookie expert but I found these cookies quite enjoyable.